We’re great with kids! 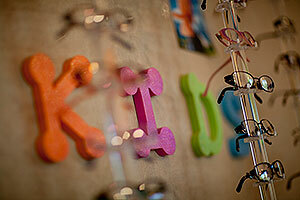 Our doctors are fully trained in pediatric eyecare. Whether you are concerned about learning disabilities, ADD, lazy eye, reading problems, or you just want to make sure your child’s vision is normal, Murrieta Optometry can help. We will determine your child’s visual status and make recommendations about how to make it the best it can be. When should kids get their eyes examined? The American Medical Association and the American Optometric Association recommend eye exams at 6 months old, 2 years old, and before starting kindergarten. Children usually don’t develop 20/20 vision until they are 5 years old. After starting school, children should get their eyes examined yearly. Unlike adults who know when their vision has worsened, kids don’t know the difference when their vision hasn’t developed properly in the first place. Kids who are far-sighted can see everything clearly, but they fatigue more quickly when reading or using the computer. Also, kids eyes don’t always develop together, and they develop a dominant eye and a lazy one, even though both eyes move together. Kids can have problems focusing and aiming their eyes without knowing it, either. Near-sightedness tends to first appear in middle school or high school, just when kids are most afraid of glasses and least likely to admit they have a problem! Many people who have been told they have learning disabilities or ADD (attention deficit disorder) really have an undiagnosed vision problem. Even if they do have learning difficulties, an underlying eye condition may be making it worse. A study in the 1990s found that as many as 40% of people who had been labeled with ADD simply had far-sightedness and/or astigmatism. When they started using glasses or contacts, their symptoms resolved! Eye tests at school or a pediatrician’s office are not comprehensive eye examinations and frequently miss important problems. It is critical that any child or adult who is having difficulties with reading or learning have a comprehensive examination by an eye doctor. More often than not, we can help!